It's at least a little weird to eat a chocolate-nut bar that's actually spicy. 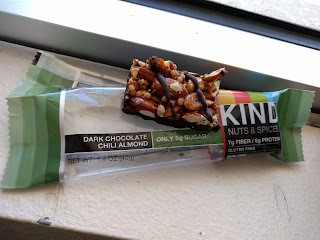 The spice doesn't come in right away, so it gives a sense of security—like it's just a plain ol' chocolate-nut bar held together by caramel, and the chili claim is just marketing noise. Sweet, crunchy, sticks to your teeth. But a good 10 seconds into chewing a bite, the spice suddenly says hello. It's potent! The fact that the sweet and spicy flavors come and go at different times make this bar a really satisfying experience. Deja Poop Score: 4/10. Extremely nutty. 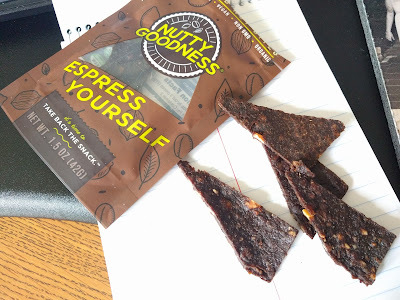 I think they gave this flavor such a tiredname because they use espresso in the mix with whatever else they press together to form this vegan imitation-jerky. It's also clear by their other flavor names ("Nana Rama," "Berry Good") that they have a preference for '80s synth pop and lack creativity. They're not referencing NWA or Mahesh Babu. I'm glad they don't try to call this beef jerky, even though it seems it's trying to look like the stuff or act as a replacement. It is not, and it doesn't have the protein content to even begin pretending. It is, however, halfway decent fruit leather—albeit with a typical-hippie grainy texture. Maybe that's the espresso. It's not particularly chewy. Not a satisfying bite. The nuts embedded give no resistance.